This trident maple was purchased from Ian Price of Lone Pine Gardens in 2010 for $400.00. I had not spent this much money for a trident before and frankly had bought much better for much less. This tree seemed to have something I found very interesting in the trunk line which I thought I could highlight and improve so I bought it. The trunk is about 3 inches across at the base and it has lots of flare under the soil to improve and expose in the future. At this point the tree is only about 15 inches tall. After reaching home from the convention I set out to achieve my future plan. Some preliminary chops were set out and options for the line were studied. In January of 2011 I noticed while uncovering the base of the tree that part of the roots were missing on one side of the trunk. The bark was removed and hormone applied and covered with cut paste. Chops were made and now I was committed to the plan. The chops were sealed and left to bud. 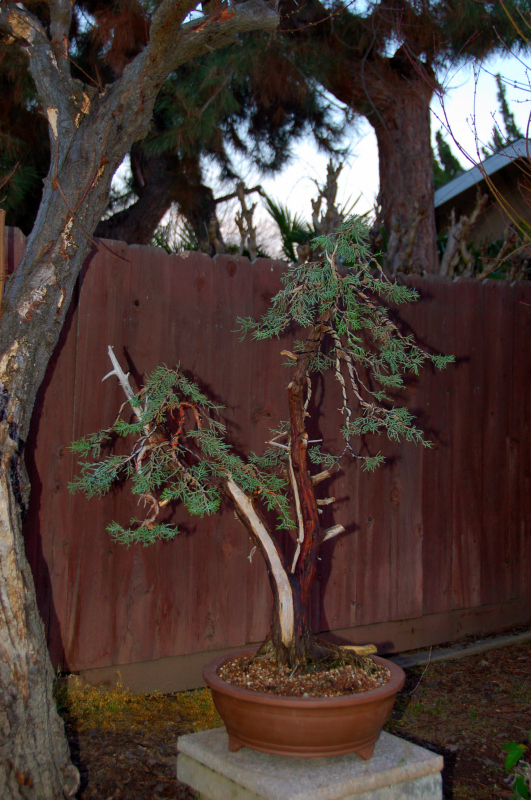 This poor Charlie Brown tree ( as my wife calls them ) is taken back to bare bones. It was pretty tough to cut off all that ramification which was probably 10 or more years old. Approach grafts were added after the grow out year. 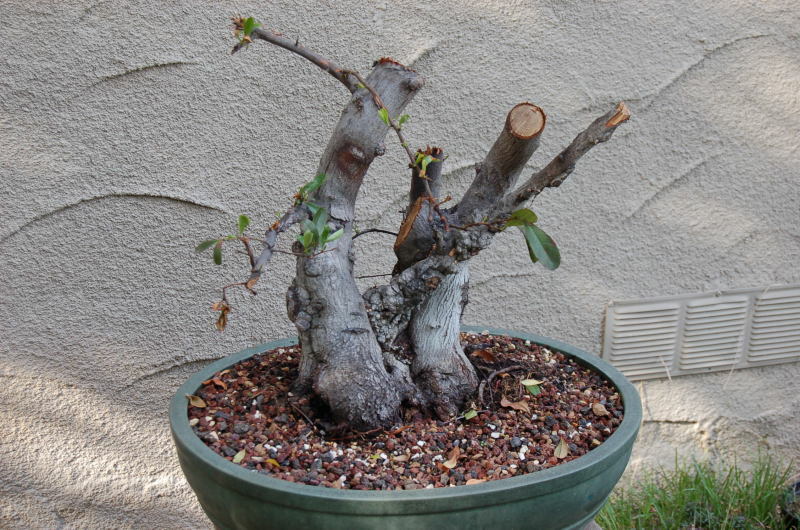 I wasn’t satisfied with how the tree was budding and decided that grafting would speed things up by a few years. By the winter of the following year a good branch structure was developing. A long growing season and lots of fertilizer and water helps things grow faster. Pruning along the way is a must and keeping up is a weekly chore. The tree in leaf is looking nice now. The tree is developing some character and the wounds are healing and better bark is developing. The trunk is now a full 1/4 inch larger across than when I started and that is pretty good in a sawed down 5 gallon nursery can. The wound I made for some ground layer roots just bridged over and no roots. The scar can be seen albeit faintly. The Fall of 2013 is showing a much improved canopy of branches and ramification. Still need lots of work on the apex area. The Spring view is shaping up. The tree has now gone thru two seasons of hedging for shape. March of 2015 and the structure of the tree is really well defined now. 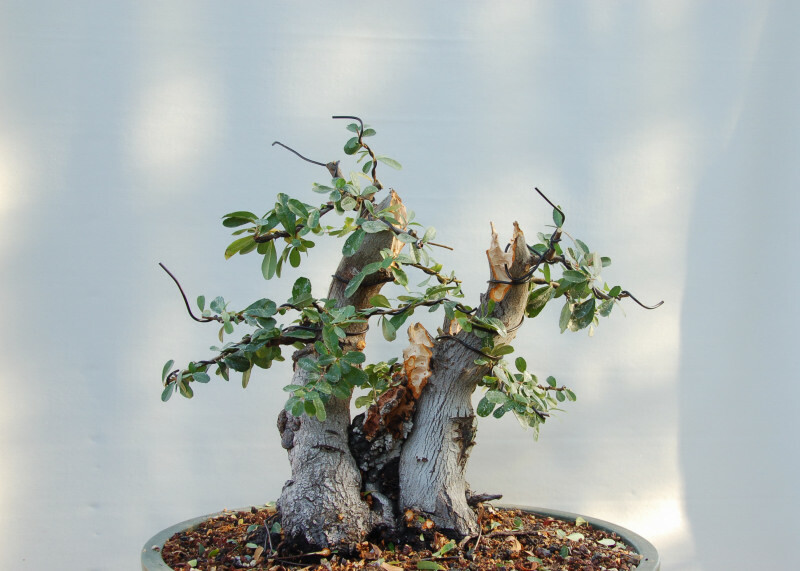 Cleaning and detailing scars is ongoing and a slow process in a small pot with continual pruning. By June of 2015 the tree is really nice now and the canopy is well defined and tight. 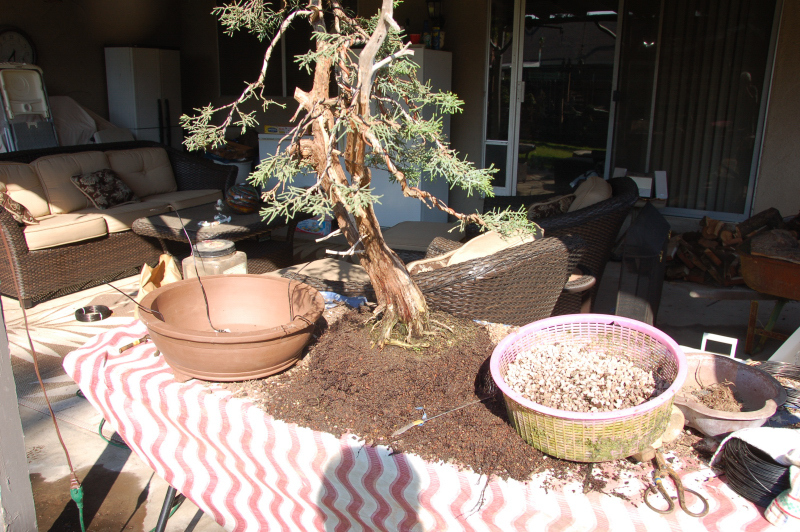 The 2016 season of repotting will put the tree into its first bonsai pot. It has been 6 years of growing and refining to get to this point. This inexpensive white training pot will suffice until 2018 when it will go into its final show pot. Some of the flare can now be seen and there is more to come. The nebari is better lower and that too will show better later. The scar from the layer attempt is on the very lower right edge of the tree and the bark shows much more red. It is completely healed over and is of no cause for concern. 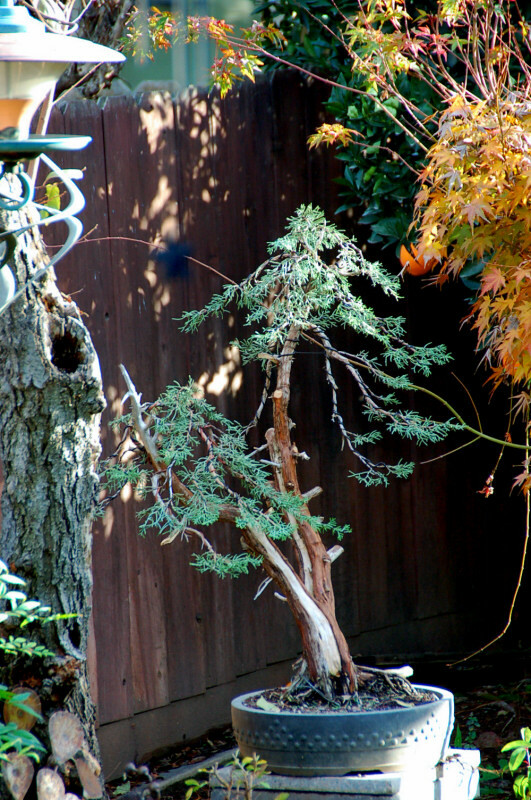 I selected this tree for an entry into the newly formed reemergence of the local Kazari Competition from the now gone Clark Center for Japanese Art. This accent composition would accompany the entry. This Japanese scroll would also accompany the display. Some pictures from the Kazari. This tree has already experienced a lot in its short life under my hand. It will be interesting to see what 6 more years might bring. Elms were allowed to grow out and then they received the first wire this week. All I have done so far is prune out the leaders for taper and chosen which branches will be retained and grown on. A group for an upright part of the crown and then the cascadeing part which will be kept rather short. I work on this tree about every 6 months. It seems it takes about that much time for the branches to gain some girth and make good sound decisions on which ones to keep and where to prune back to. Pyracanthas are not so much a tree that will develop any kind of twiggy ramification and is more like building green images with leaves. These green images are mounds of leaves which give the indication of a well ramified branch. Pyracantha’s are in a constant state of pinching and pruning noting that pinching in this case is definately with scissors. Thorns are long and will get you many time during a session. The tree are fast growing, respond well to pot culture and are pretty tough. 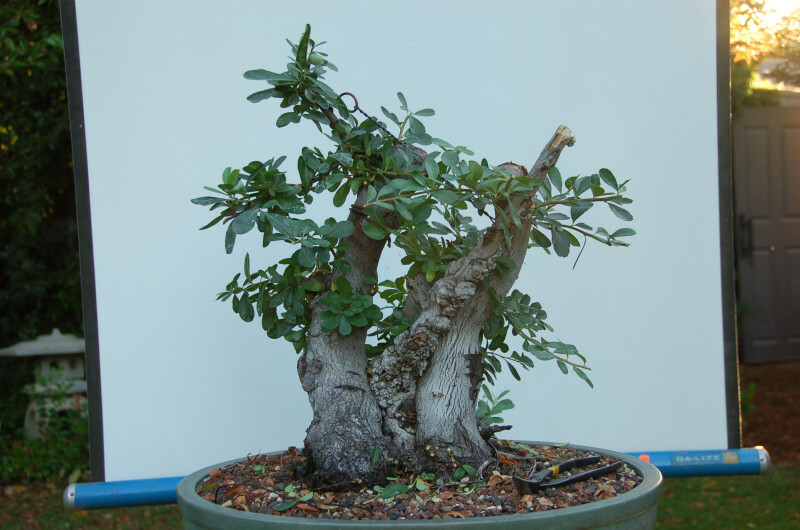 They do like moist soil and even an hour off regular watering will show droopy and limp ends on branches. Water will perk them up in 15 minutes. After trimming, wire and sonme carvng on the left trunk. Its been ten years since I put this Ca. juniper in the huge mica pot. I bought the pot many years ago, probably about 20 when mica pots were very cheap. I think I paid like 12.00 for this one. It is about 20 inches across and 5 inches deep. 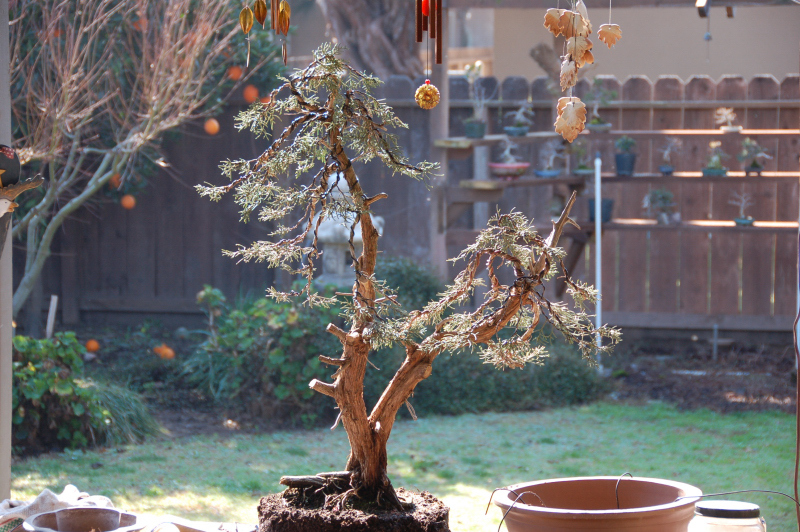 It worked well for an olive I dug and subsequently killed and so I put the large juniper in it. There it stayed for 10 years until today. 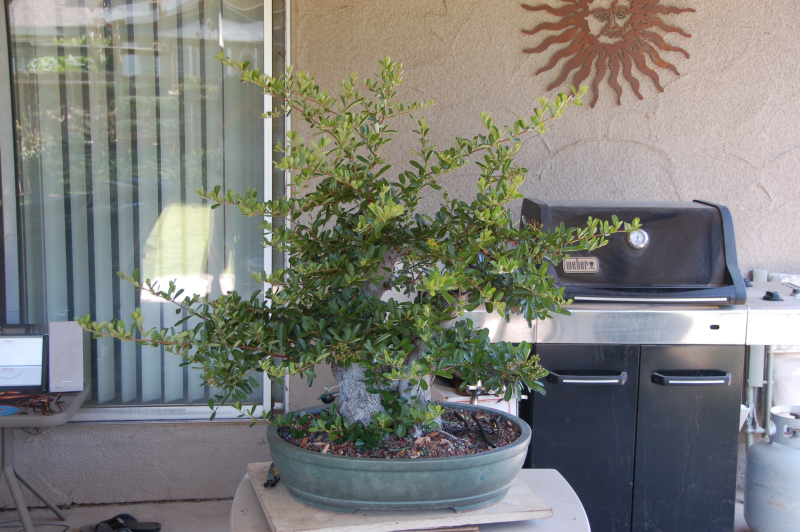 The new pot which I purchased at the local bonsai nursery, NeeHai, was available and I purchase local whenever I can. It is very nice to have a local nursery like this to buy dry goods for bonsai. I would be lost without it. The new pot is about the same size. Maybe just a tad smaller in diameter. The tree is out of the plastic pot first time in ten years. Teasing out the roots. This took some time since the tree had grown a ton of roots over the last ten years. It was very healthy being grown in 3/16 lava and sand. This thing grew very hard in the soil. Much like what it is acustom to in the wild. The tree all potted up. Probably not a finish pot, but it will look better on the stand that then the mica pot did. Now all I can do is water fertilize prune and hope the summer is not too hard on the new growth till it gets used to this pot. Over 80 percent of the rootball is intact and all I did was free the outer 20 perccent for a backfill of new soil. These Ca. 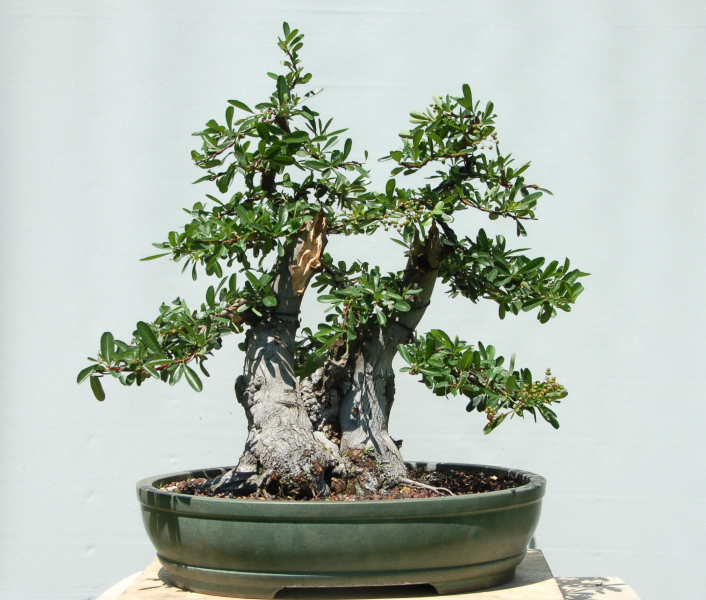 junipers love to grow all confined in the pot and actually do better when root bound and compact. To free up the ball totaly is just so unnecessary and holds the tree back for years.